There is a lot of false information out there about food stamps and the people who receive them. It’s important to separate the common myths and misconceptions from the truth about food stamps — such as, just who are those 1 in 7 of our neighbors who rely on them? Both federal and state legislators – typically self-described conservatives – regularly try to place limits on the Supplemental Nutrition Assistance Program (SNAP, or “food stamps”). In recent years, they have tried to cut food stamp funding at every opportunity. They propose rules to humiliate and demonize recipients of food stamps and other welfare programs, which they claim create a “culture of dependency.” President Trump wants the biggest cut to the program in decades. The fight continues to protect food assistance benefits as the first line of defense against both hunger and poverty. 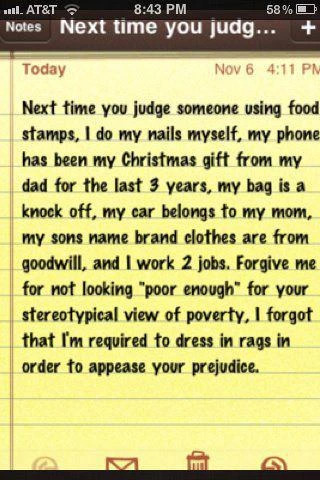 Therefore people must understand how the food stamps program works, who it helps, and how much it costs. Can anyone can get food stamps, settle back, and live high off the hog? You’ve likely heard stories (and outrage) about people using food stamps to purchase “steak and lobster” as well as cigarettes and alcohol, showing up at the grocery store in a nice car, nice clothes, a nice purse or an iPhone. But the federal government sets the food stamps benefit amount at, on average, roughly $4 a day per person. Yes, someone could save up their monthly allotment to buy some high-priced food items for a special occasion. (You can’t use food stamps to buy prepared foods or anything that’s not food.) They are likely eating rice and beans, peanut butter sandwiches – and going hungry – the rest of the month. Moreover, many people living in poverty fell into it through job loss, the loss of a partner or spouse, or a major illness or accident. They will maintain appearances and hold onto their nice things for as long as they can afford to. After all, they’re clearly being judged by those around them. And you have to prove it. 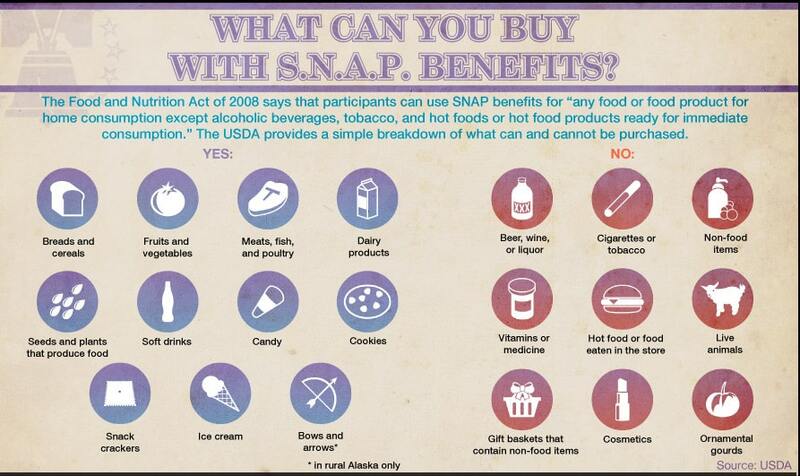 The U.S. Congress sets the rules and the funding for the SNAP/food stamps program, and then states administer it. To be eligible for food stamps your social security number is run through a number of government databases and you have to provide documents of your income and all your expenses. You have to prove that you are at or below 130% of federal poverty level guidelines, which determines what a livable income is based on household size. For a family of three in Pennsylvania who are all under age 60 with no disabilities, the maximum qualifying income for food stamps is $2,688/month (or about $32k/year). This cutoff varies by state. Some people aren’t eligible for food stamps regardless of income, such as all undocumented immigrants, certain legal immigrants, and individuals who are on strike. States can also opt in to federal rules on food stamps eligibility, by requiring asset tests, or create their own, like barring those who fail drug tests or with prior criminal offenses. And, if possible, you must be working. Should the U.S. be spending so much on food stamps? 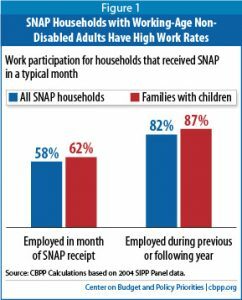 83% of all SNAP/food stamp benefits go to households with a child, senior, or disabled person. Most food stamp recipients are children and the elderly. Are these the people we want to turn our backs on? Legislators complain that food stamp spending in recent years has reached record highs. So has defense spending, but they justify that with the country’s ongoing military activity and wars. Shouldn’t there be a war on hunger and poverty? Food stamp spending is a tiny fraction of overall government spending—just 2% in 2012. (For comparison, we spent 19% of the U.S. budget that year on defense.) And nearly all of that spending (93%) goes directly to households to help them purchase food. The food stamps program is highly efficient in terms of bang for the tax-payers’ bucks: it reaches the majority of people who need it and helps lift 4.7 million people out of poverty (reducing child poverty by 3%), thereby reducing hunger’s enormous costs to society ($6 billion in Pennsylvania alone). Every $5 in food stamp benefits nearly doubles the dollars in economic activity. The majority of Americans have consistently supported the food stamp program and think cutting it is the wrong way to reduce government spending. In fact, we’re not spending enough on food stamps. The need for food assistance is greater than food stamps can fill, and the benefit amount is too low to allow a family to purchase an adequate, healthy diet. The average monthly food stamp benefit per person is only $133.85, or less than $1.50 per person, per meal. Between 2009-2011 the purchasing power of food stamps declined by about 7%, or $47/month for a family of four, due to inflation in the cost of food. Only 55% of food insecure individuals are income-eligible for food stamps. More than 1/4 of food insecure people (29%) are not income-eligible for any federal food assistance. Why has food stamp enrollment grown? The federal government created food stamps as an entitlement program so that anyone who qualifies can immediately receive nutrition assistance. Funding for the program automatically expands based on need; this keeps people from starving during hard times. Not surprisingly, participation in SNAP/food stamps increased by 70% between 2007 and 2011 due to the economic recession. This was exactly how the program was intended to operate. With unemployment high and wages not keeping up with the costs of living, food stamp participation will rise. But food stamp enrollment is already significantly decreasing as the economy and employment rates improve. Food stamp recipients are not lazy or relying on welfare to get by. 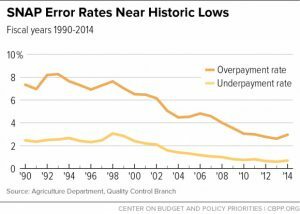 It used to be that more food stamp recipients received government cash assistance and few worked. But after the 1996 Welfare Reform Act remade welfare as Temporary Assistance for Needy Families and turned it over to the states, only a fraction of families in deep poverty who qualify for cash assistance receive it. So while in 1989, 42% of families receiving food stamps also received cash assistance, that portion had dropped to less than 10% by 2009. Around 2/3 of food stamp recipients are not expected to work because they are senior citizens on a reduced income, people with disabilities, or children. The remaining third of SNAP households have at least one working-age, non-disabled adult. Of these, more than half work while receiving SNAP — and more than 80 percent work in the year before or after receiving SNAP. The rates are even higher for families with children. As stated above, work requirements for food stamps were put back in place in 2016. The benefits are intended as short-term assistance for those who work until they can get back on their feet. 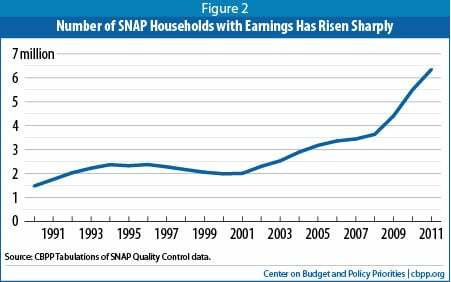 Unfortunately, a growing number of SNAP households are employed. They’re working but still can’t get by. These are households in which one of the two wage-earners lost their job or became disabled. Or they are among the increasing numbers of Americans who are in low-wage jobs or are not getting enough hours to cover rising rents, heating, health care costs, and other necessary expenses, including food. The food stamp program is not full of widespread waste, fraud, and abuse. The U.S. Department of Agriculture (USDA), which oversees SNAP, takes food stamp fraud seriously. 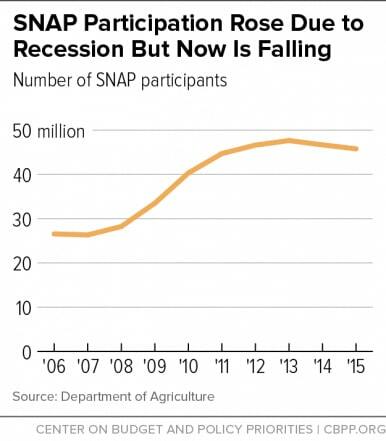 It reports that the SNAP trafficking rate – people who sell food stamps for cash – has fallen significantly, from about 4 cents on the dollar in 1993 to about 1 cent in 2006-08 (last data available). Furthermore, money lost to SNAP waste and abuse is a drop in the bucket compared to the $125 billion the U.S. Department of Defense is wasting. This department has never even been audited, yet our current president wants to give it more. Is food stamp spending smart? Additionally, spending on food assistance helps the economy more than any other stimulus spending. Each $5 of federal food stamp benefits generates an estimated $9.00 in economic activity. How? Those dollars go to people living paycheck to paycheck. They immediately spend the benefits on food. This leaves them more income to spend on other things, which boosts our economy and helps create jobs. Why are any cuts morally wrong? There is broad public support for a strong safety net in our country, the richest on the planet. Yet elected officials constantly tell us that while the U.S. can afford endless tax breaks for corporations and the wealthy it must tighten its belt when it comes to the programs that help set basic living standards. Legislators should not balance budgets on the backs of working people and vulnerable households, especially when roughly one in eight Americans are living in poverty at any given time. Be a part of the growing movement for a more compassionate and sensible welfare system. Receive monthly updates on our progress on this issue and how you can be a part of positive change. The overhwelming majority of food stamp recipients are seniors, people with disabilities, and working families. Beaver County resident Brandie Waxler, a mother of two who just graduated from CCAC and is seeking employment as a dietetic technician, says her monthly SNAP allotment is “very helpful in providing food for my children as well as for myself. It really takes a burden off my shoulders to know that I am able to provide for my family in that way. I don’t know how I would pay for the food we need otherwise." President Johnson created the food stamp program (now called the Supplemental Nutrition Assistance Program or "SNAP") in 1964 along with Medicaid, Head Start, Job Corps and a number of other programs to help address poverty in the U.S., which at that time was at 19% (compared with roughly 15.5% today). Congress votes to determine the funding for the food stamp program (and other food assistance programs) every five years in the U.S. Farm Bill. Because food stamps are an entitlement – anyone who meets the guidelines can get food stamps – if Congress wants to cut funding for food stamps then they have to make more severe guidelines about who can get them. Congress most recently attempted this in 2014 by forcing states to pay a greater portion of "heat-and-eat", the measure that helps people who can't demonstrate their heating costs (typically seniors and those in public housing) still be able to qualify for food stamps. Fortunately, Pennsylvania is among the states that are happily picking up that tab, in part because heat-and-eat helps their LIHEAP and food stamps administration efforts operate more efficiently. 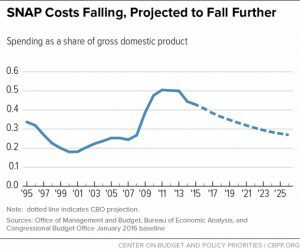 Congress did succeed, however, in cutting funding for the food stamps program (and people's benefit amounts) nationwide in November 2013 by ending the extra money that was given to the program during the recent recession. Current federal government policy says people can only receive food stamps if their total earnings (gross income) are at or below 130% of the federal poverty line, and their net income is at or below 100% of poverty after a range of deductions for things like household size, costs of dependent care and housing, and certain medical costs. Seniors and those with disabilities only have to meet the net income requirement. Gross and net income limits are higher for people living in Hawaii and Alaska, where the cost of living is higher. "Categorical eligibility" is used in Pennsylvania and 39 other states to help people who receive Temporary Assistance for Needy Families (TANF or "cash assistance") and other assistance programs to automatically qualify for food stamps. Food stamp recipients are required to update their state caseworker with any changes to their eligibility status – such as a change in work hours, household size, or an income change greater than $100 – within a month. In Pennsylvania, this information is verified at a "recertifcation process" twice a year. If the state determines someone lied in order to receive more food stamps than they were eligible for, they are ordered to repay it and can be accused of fraud, which can come with a hefty fine and jail time.